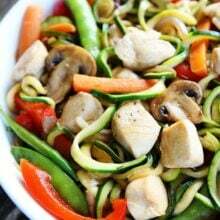 Easy Chicken Zucchini Noodle Stir Fry-this easy and healthy stir fry can be on your dinner table in 30 minutes! It is much better than takeout! Our boys like vegetables, but they don’t love them. They don’t jump up and down and beg for vegetables like they do with berries, yogurt, and cookies. Hopefully, someday they will do a front flip when I tell them salad is for dinner:) Right now, we are taking things one bite at a time! Caleb and Maxwell do get excited when we get out our Inspiralizer to make dinner. They think it is the coolest kitchen tool…and it is! They love watching us turn vegetables into noodles! It’s like we have our own magic show in our kitchen..ha! 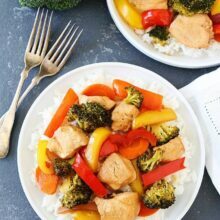 This healthy and delicious stir fry is perfect for busy weeknights because it only takes 30 minutes to make. It is easier than getting takeout! 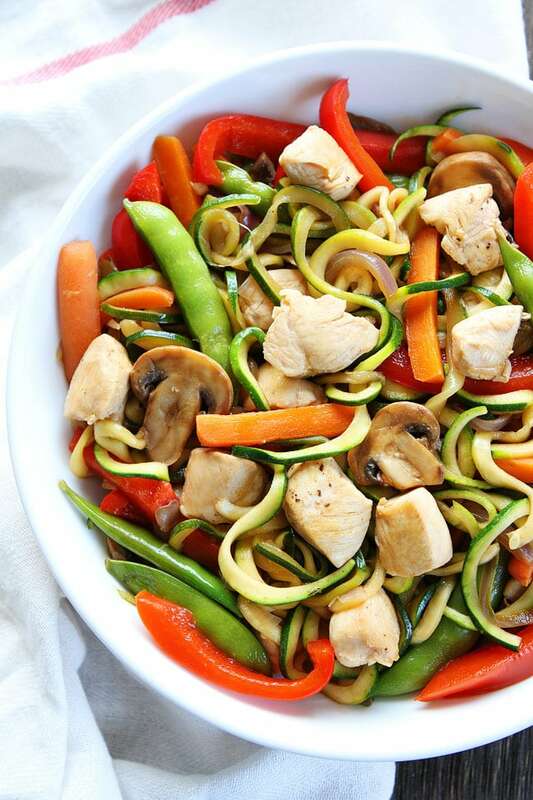 This stir fry is loaded with colorful vegetables, chicken, and a simple sauce! And the zucchini noodles are genius! They are fun to eat, healthy, delicious, and so filling! 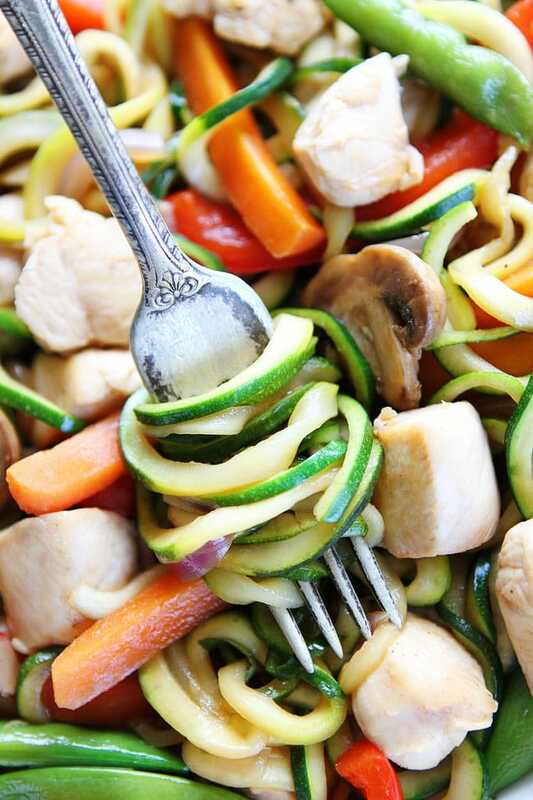 If you are looking for a new way to enjoy vegetables, try this Easy Chicken Zucchini Noodle Stir Fry. It was a hit at our dinner table! I think the boys may have even LOVED it! And make sure you check out the Inspiralizer, it is the best! 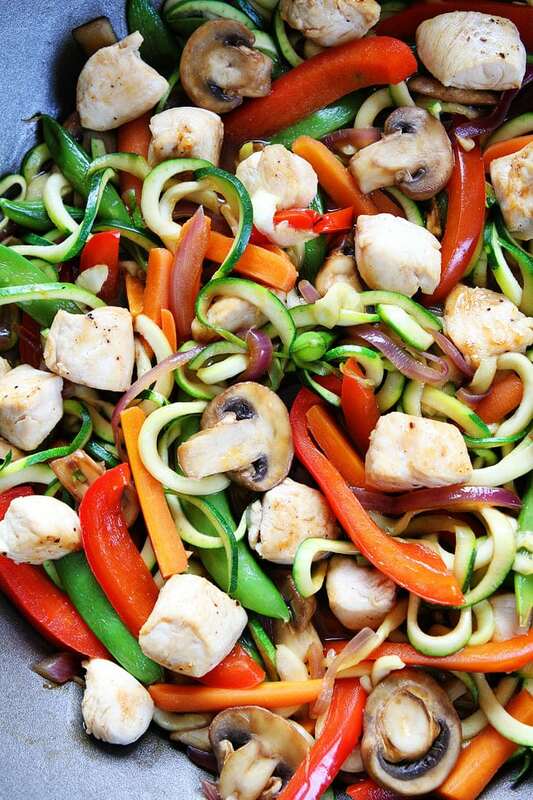 This easy and healthy stir fry can be on your dinner table in 30 minutes! In a small bowl, whisk together the broth, hoisin sauce, soy sauce, cornstarch, sesame oil, ginger, and Sriracha sauce. Set aside. Place a large sauté pan or wok over medium heat. Add 1 tablespoon of the olive oil and allow it to get hot, this will take about a minute. Add the chicken and cook, stirring occasionally, until the chicken is cooked through, about 4-5 minutes. Transfer the chicken to a plate and set aside. Heat the pan back up and add the other tablespoon of olive oil. Add the peppers, carrot, red onion, snap peas, mushrooms, and garlic. Cook, stirring constantly, until vegetables are tender, but still crisp, about 4 minutes. Add the sauce to the pan and cook until the sauce thickens up, about 2-3 minutes. Add the chicken to the pan and stir to combine. Gently stir in the zucchini noodles. Cook for 1 minute, making sure the noodles are well coated with the sauce. Note-if you want to make the stir fry vegetarian or vegan, you can leave out the chicken. For gluten free, make sure you use Tamari sauce. My kids love spiralizing with us too! They’d rather spiralize than use their bounce house (indoors because we’re weird like that). It’s great that I can get this meal done in under 30 minutes. I’m on dinner duty once a week, great wife cooks the rest of the time. This will be my next turn! Love how healthy this is with the zoodles!! As a diabetic, I absolutely love veggie noodles and this looks absolutely delicious! 🙂 I have a small handheld spiralizer that I’m not the craziest about, so I just may have to check out that inspiralizer. That looks more like what I need and much easier!! Thanks for sharing!! Hi Alison, I am also a diabetic. Making spiralizer noodles has helped me bring my numbers back under control. I was feeling so depraved about not being able to eat pasta (even whole grain) or rice (even brown rice). I am an Italian and it goes against my upbringing. My husband bought me the KitchenAid spiralizer for Christmas. I really didn’t like it and it was so expensive. I was able to return it and I purchased the Inspiralizer. I find it easy to use and clean. Hope my comments have helped. This looks delicious! My sources tell me that I’ll be getting an Inspiralizer for my birthday, so I’m looking forward to playing around with it with recipes like this! Gorgeous! I absolutely adore a good stir-fry. These noodles look so delicious! 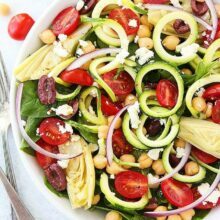 Even though I am not much of a fan of zucchini noodles, I love your recipes & I know this will rock too!! Ha! 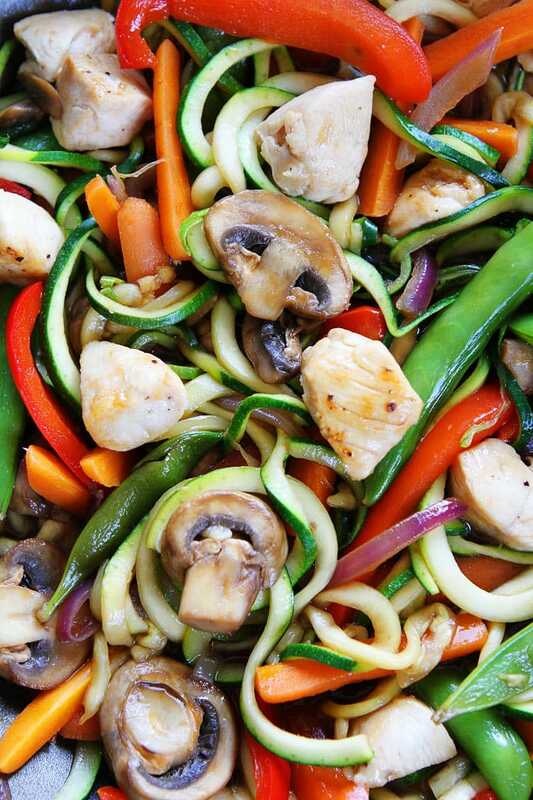 I just made a recipe like this the other day because my kids are obsessed with stir fry right now! It’s so fast and easy- yours looks delicious! 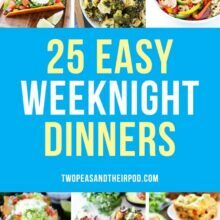 Ever since I purchased a spiralizer I’ve been on the lookout for simple weeknight meals. This looks delicious and flavorful! Yessss! 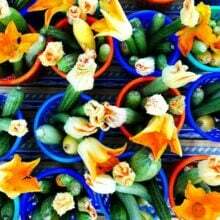 This totally just transported me to summer and I can’t wait for more dishes like this! 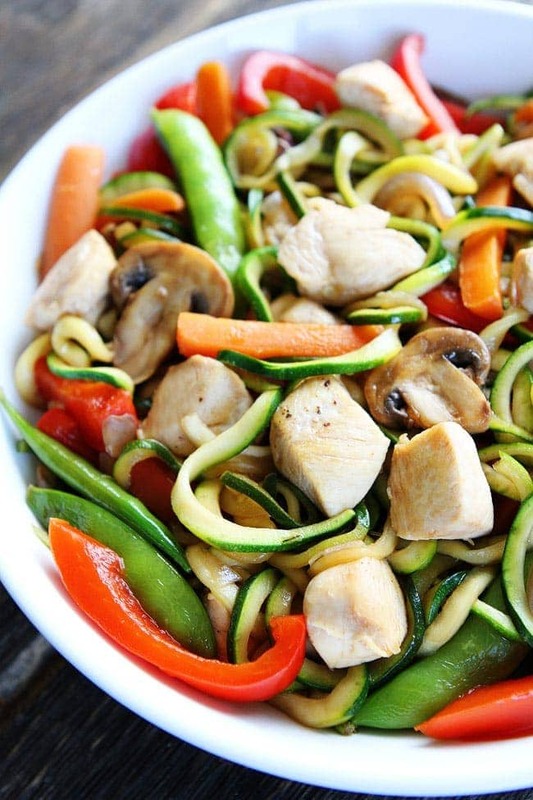 Love zucchini noodles too! I made this recipe for lunch earlier today but substituted chicken with tofu. I also added toasted sesame seeds and roasted cashew nuts, came out great. Just made this for dinner tonight! AMAZING!! Even the kids went crazy! Definitely will go into rotation! Great with some fresh pineapple on the side! I’ve wanted to try zucchini noodles for a long time. Finally bought a veggetti and googled for recipes with chicken since that’s what I have. I found this and it was amazing!! Even my picky 15 yr old loved it! Thank you!